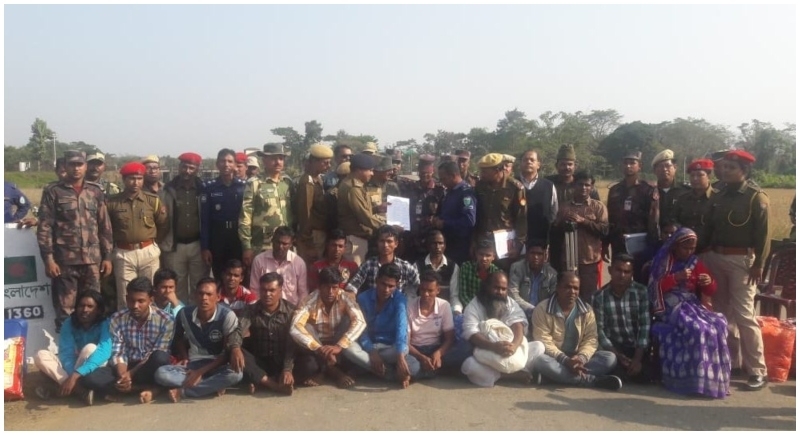 Karimganj, January 19: Swiping out illegal migrants, the Assam Border police on Saturday, successfully deported 21 Bangladeshi nationals back to their country from Sutarkandi ICP, along the international border. The move came in after the Bangladeshi nationals were detained for violation of Passport Act. The move was made after getting an approval from the Ministry of Home Affairs. The Bangladeshi nationals were detained for violation of Passport Act and were kept at the detention camp of Silchar Central Jail after they were nabbed at different points of time. They were caught while entering the Indian border through the two border districts of the valley. While 15 of them were detected in Karimganj, the other six were held from Cachar. The Superintendent of Police informed that all the Bangladeshis were being held on different durations by the border police force and were deported today after thorough verification.